The All Good Loaf -- Gluten-free, Allergen-free, Vegan, Easy, and Delicious! It is snowing like crazy here in the Midwest, and I know it's cold all over the country. My friend in Texas said it was in the teens last night! This weather makes me think of soup, stew and warm bread. Our Welcoming Kitchen cookbook has several bread options, but it won't be available until Spring 2011. 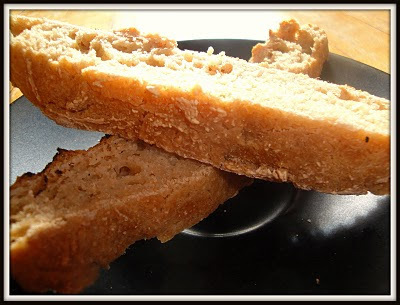 That's a long time to wait, so I set out to come up with another easy, gluten-free, allergen-free, and vegan bread that would go great with the soups, chilis and stews that warm up a cold evening. Inspired by a video I saw on Youtube of Dr. Jeff Hertzberg and Zoe Francois showcasing their basic technique from their book, Artisan Bread in Five Minutes a Day, I played around with some ingredients I had on hand and voila! A gorgeous bread! I made two small loaves from the dough recipe below. The dough was very wet, almost runny, when I put it into the refrigerator. It was still very moist when I formed the loaves this morning. Although they didn't bake up tall, they have a crunchy exterior and a spongy, moist interior. The flavor was great, too. They have lots of air pockets, thanks to the yeast, but no yeasty flavor or smell. Best of all, they were quick, easy, and no kneading was required. In a large container with a cover (I used an 11.5 cup plastic container), combine first three ingredients. Mix together well. Add warm water, and mix with your hand until all the ingredients are incorporated well. Cover and place in refrigerator for 10-12 hours. Dust a pastry board or cutting board with a little more oat flour or cornmeal. Lightly cover with a clean dish towel. Place dough on a parchment-paper-covered baking sheet. Score the top of each loaf with an X. Let loaves cool on a cooling rack. Cool to see what you have done! I always appreciate experimental baking. Have you tried this with other flours? Oat flour seems so moist to me. I wonder if the bread would be drier with something else. Maybe sorghum, teff, or timtanta? Thanks for your comment! I have not tried it with other flours, but I definitely am going to experiment with this in the future. If you do, please let us know how it turns out. Hi, what a lovely blog! I have to eat glutenfree so I like to read your recipes for inspiration. I'm from the Netherlands and on my blog I just added a recipe for a Christmas bread. If you like I can translate it for you. The picture of your bread looks lovely. I'm sure our readers would really appreciate a translation. Thank you so much! This looks wonderful!! Thank you for creating this! I loved using that method of bread baking before i went GF! I'm excited to try your version!! Perfect!! Just perfect! !